MADRID — A group of LGBT people who work in the high-tech industry used 2017 WorldPride as an opportunity to try and help the victims of the ongoing crackdown against gay men in Chechnya. Google on June 29 hosted participants in the Tech4Chechnya campaign at their Madrid offices. More than 20 people took part in a “hackathon” in which they sought to help develop apps and software that would allow advocates to better communicate with gay men in Chechnya. Tech4Chechnya participants also spoke on Skype with members of the Moscow-based Russian LGBT Network about how they can use technology to provide additional assistance to gay Chechens who have fled their homeland. 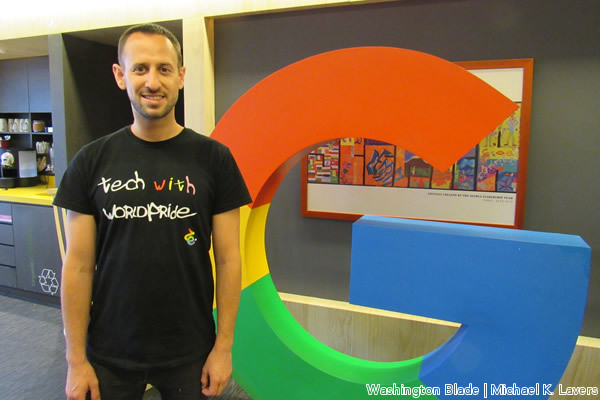 Representatives from InterPride, which organizes WorldPride, and others from Google and OutRight Action International are among those who also spoke with Tech4Chechnya participants. A gala the campaign held at a Madrid nightclub on June 30 raised money for English courses for gay Chechens in Russia who want to leave the country. “Sometimes it’s better for them to not stay in Russia,” Mintzer told the Blade. Novaya Gazeta, an independent Russian newspaper, in April reported Chechen authorities have arrested more than 100 men because of their sexual orientation — or perceived sexual orientation. Reports indicate several of these men have reportedly died after their arrest, while others have been beaten and tortured and sent to secret prisons. “It is a very big problem,” Escandia Camergo, a Tech4Chechnya participant from Mexico City, told the Blade on June 29. More than a million people lined the streets of Madrid on June 30 for the 2017 WorldPride march and parade. Several dozen Russian LGBT rights advocates took part in the march from the Atocha train station to Plaza de Colón. Other participants highlighted their opposition to Putin. Madrid Mayor Manuela Carmena did not specifically mention Chechnya in remarks that she delivered at a WorldPride reception earlier in the week. She did note LGBT and intersex people in many countries around the world continue to face persecution because of their sexual orientation or gender identity. “We can do something to change the world and hopefully make the world a slightly better place,” he said. U.S. Ambassador to the U.N. Nikki Haley, French President Emmanuel Macron, German Chancellor Angela Merkel and Canadian Prime Minister Justin are among those who have condemned the crackdown against gay men in Chechnya. President Trump — who met with Putin on July 7 during the G-20 summit in Germany — and Secretary of State Rex Tillerson have yet to publicly comment on it.